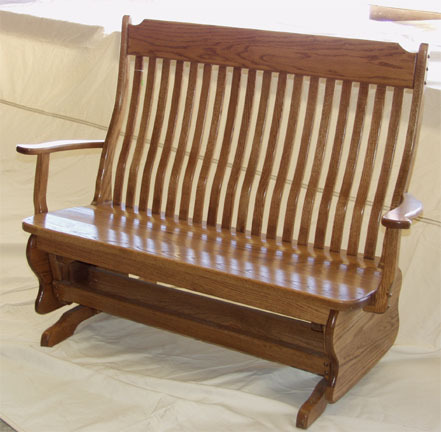 Our latest addition from the Amish is our solid oak glider bench. The construction and appearance is just like our solid oak glider, but almost 3 times as wide. Big enough to seat 2 adults and a child or 3 smaller adults comfortably, and it moves smoothly and quietly on its sturdy glider mechanism. Perfect by itself, or as a companion to our solid oak glider, we’re sure you will agree that it’s a winner. We also have a matching ottoman available (see below).